As the name might attest, color plays an important role in my Ruins of the Red Empire campaign. Characters can find magic items sculpted from dyed clay and explore ruins left by ancient cults that worshipped color in its primal form. Most importantly, however, characters can quest for colored swords. In Niō prefecture, where my campaign takes place, all ogres (oni) and demons (yōkai) have an associated color (by and large—there are exceptions). I've been naming monsters this way for ages. To me, "Yellow Bull Demon" or "White Ritual Demon" are evocative sequences of words in of themselves, and each immediately provokes a host of images when I hear it. Besides giving the campaign a unique bit of flavor and another layer of mechanics, I like this rule because it allows me to offer a reward between mundane weapons and magic weapons. I don't like to distribute +1 swords too early in the campaign, so colored swords serve as a useful stand-in. Besides, players love to collect them. In the last campaign I ran with this mechanic, players devised whatever means they could to acquire dyed swords, knowing that they were often the only tool one could use to drive back malicious demons. I never quite decided what should happen if a player struck a demon with a sword colored the same as it was. I'd be curious to hear suggestions. I let this blog (and my last campaign) fall into disrepair—which is a shame. But I have a new campaign on the horizon, and thus here I am. Please accept this map as consolation. I haven't been posting as regularly as I'd like, but I have a justification: I've been spending that time working on game material instead. My first session was this past weekend, and I have to say it went about as perfectly as a first session can. The players began in Ofsgoll (depicted below), the northernmost town in the kingdom of Sundria, which sits right on the edge of a vast tract of wilderness called the Wyldenlands ("Nerg Wehfdelank" in the native tongue). The Wyldenlands are known to be a den of monsters, dark magicks and ancient ruins, and as such Sundria and neighboring kingdom Alandia have constructed numerous border towns to monitor the spread of evil (another such town, Asjergoll, lies a few days to the west of Ofsgoll). The players, as is custom, headed for the town's only inn, the Painted Dragon, so called for the large painting of a multicolored dragon that dominates one of its walls. Here, amidst candlesmoke and blueberry wine, the players found Nicolas, a fellow of some ill report, who is known for leading adventurers to reported ruins in the surrounding countryside (usually to no good end). He beckoned the players over, and they decided to give him some attention. On the table before him sat a large object under a burlap sheet, and he questioned the party if they were curious as to what it was. Obliging him, they said they were. With an awkward flourish, he drew back the sheet, reviewing the horrible skull of a fish man. This, he claimed, he found near some ruins along the river Yspyr to the west. And, in case the fish head weren't enough, he tossed a round object onto the table, where it landed with a heavy sound: a piece of dark elf gold. This had the players intrigued, and they agreed to set off with Nicolas into the wilds the following morning. First, though, they asked Nicolas if he knew of any hired help, and he said he could lend them two of his bodyguards. They returned to the tavern that evening to find a massive barbarian from South Gilderland, Hrothgar, and his swordbearer, Reynold. Hrothgar agreed to adventure with them for a 20% share of treasure (15 percent going to him, 5 to Reynold), to which the players agreed (this on top of the 10% they were paying to Nicolas as a finders fee). With terms ironed out, the party set out the following morning. The trip was uneventful, Hrothgar and Borean (the party's fighter) rowing briskly up the river. Though they anticipated it, no fish men were seen during the journey. Eventually they came to a stone bridge which crossed the river, hills rising on both sides. From their boat they could see the roof of the moon elven temple reported to lay in the valley, but they decided to explore the temple later and focus on the dungeon for now, the entrance to which lay beneath the bridge on the east side. The entrance to the dungeon was a heavy iron grate, which lay partially open. After prodding it with a branch from a nearby tree, Borean determined it to be safe and the party entered. The entry room (marked 1 on the map) was of white marble veined with blue, and the wall was ringed with a dark elf script near the floor. 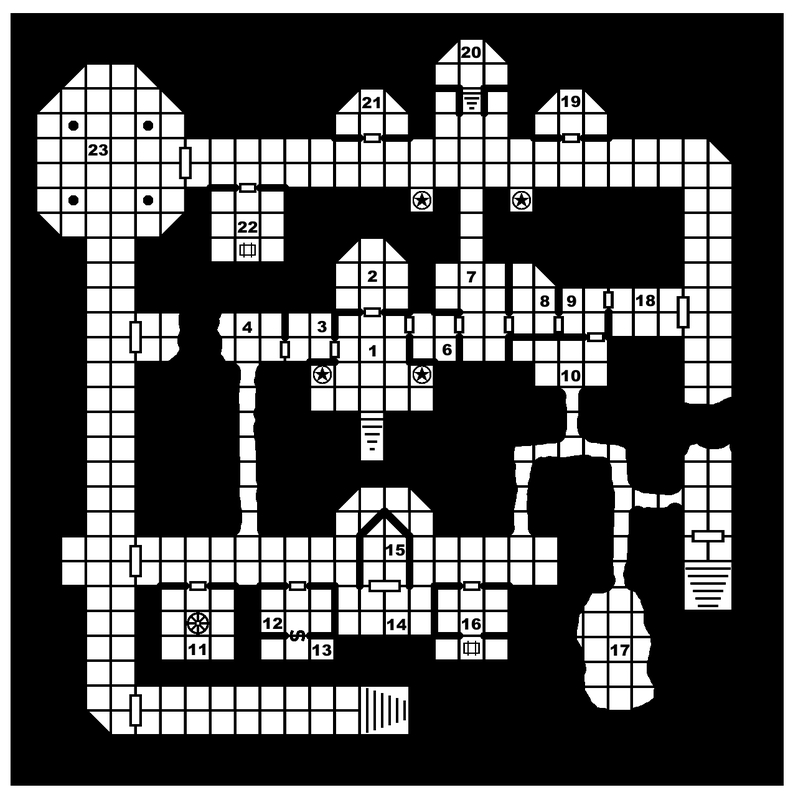 There was a clearly visible trapdoor exactly in the middle of the room, but the players couldn't find any means to open it so they left it alone, and after taking a quick peek down the hallway proceeded into room 2. This room was the inverse of room 1: a room of black marble with white dark elf script. The party's torches almost seemed diminished in this room, but a careful search revealed another trapdoor that they also couldn't open. Deciding to leave the trapdoors for later, they proceeded to room 3. This room, likely ceremonial, had stone outcroppings on the northern and eastern walls, and dressing screens in the northeast and southeast corner. The party split up to investigate. The outcroppings both had bronze saucers on them, filled with murky water, and a few overturned saucers lay at the foot of the northern outrcropping. The only other thing of note to be found was the frame of a mirror behind one of the dressing screens. Ignoring this, the party attempted the door to the east, which was of banded wood and locked. The thief failed to pick it, so the party decided to leave it be for now, and headed down the hallway to room 5. Here they found a large pool with giant frogs lazing in it. To the south was a stone door with no visible means of opening flanked by two statues. Each statue held a saucer in an outstretched hand, and one statue covered its eyes while the other covered its heart. In the saucer of the statue covering its heart was a bit of dried blood, and Borean decided to add some blood of his own to it. This elicited the turning of some mechanism in the wall, but as the players couldn't decide what to place in the other basin they decided to leave the room alone. Room 7 was infested with roots, from one of which hung a fish man. A table beneath the fish man was covered with scattered playing cards, which Borean inspected, while Lithe the magic-user prodded the fish man. This revealed a stitched wound on his stomach, and when cut open his innards fell out onto the table, and the thud of metal was heard: a key (the players did not think to investigate the thick roots covering the southern wall, which concealed a stone door). The party moved onward to room 11, where they found more locked doors with no visible means of opening. The statue in the middle of the room was of an elven woman with a moon on her back, gesturing to the west with one hand and holding the moon with the other. The party quickly discovered not only, 1. that the statute moved, but, 2. that there was a secret door to the north, and once two and two were put together they decided to turn the statue to the north. However, as it wasn't often turned this way, the mechanism jarred and made a horrible noise, drawing some fish men from another chamber. However, they couldn't get through the western door (which was now locked as the statue wasn't pointing at it), so the fish men camped outside the door while the PCs investigated the secret chamber. Within was a statue holding a stone moon in outstretched arms. A groove ran around the moon, and the players pried it open to find a black glass sphere inside. Then, they found a matching groove on the statue in room 11, and with their combined strength they pried this one open as well. This moon was also hollow, and had an opening at the bottom clearly the same size as the sphere. Thus the sphere was inserted, and a secret compartment on the breast of the statue popped open revealing a silver dagger, a set of masterfully crafted panpipes (worth 450gp) and four silver vials (two of which contained liquid). Now that the treasure was counted, the players had to decide what to do with the fish men. Rather than risking the mechanism jarring again, they decided to turn the statue to the west, opening the door. The ensuing combat went rather well, despite the fish men winning initiative every round. Only Hrothgar perished (Borean and Lithe were merely wounded), and the players got some gratuitously gory shots in: arrows to the eye, decapitations, the like. Finally, with treasure in hand, and monsters slain, the party decided to return to town. 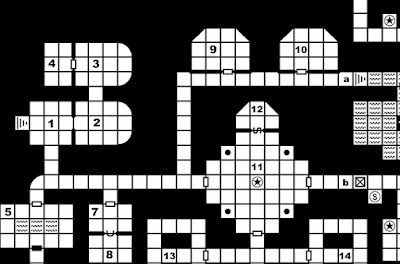 All in all, it was an excellent first session, and it's always fun to see players that are new to old school D&D get into the rhythm of the dungeon crawl. I know these write-ups are probably not really entertaining to anyone outside of my party, but I thought I ought to do one anyway. I'll get back to some more useful posts here soon. There's a certain school of thought in the OSR that all humanoid opponents should be removed from the game and replaced with solely humans. While I won't summarize them here, the arguments are sensible, and for the right type of game I think it's a wise choice. It's a principle I adhered to myself for a good while. However, as my tastes have circled around to pulp fantasy, I've welcomed humanoid opponents back into the fold. In this post I'd like to offer my case for humanoid opponents, and discuss how to design interesting ones. Most of the issues with humanoid opponents, I think, are directed towards the orcs and goblins of the world. Mechanically, these creatures are undifferentiated from humans, and even in their tactics they don't fundamentally operate differently than humans. All they have to offer is their flavor — and their flavor is bland. Certainly cases have been made for these monsters elsewhere, but I still find this variety of monstrous humanoid boring in general. What I'm more drawn to are beast men: fish men, bird men, insect men, jackal men and the like. In creating my Seven Rivers campaign, I decided I needed a key conceit, something to differentiate my world from the myriad others. What I settled upon was this: the campaign takes place in the nation of Ampyrsyvad, which is composed of many tiny fortified city states with vast swaths of wilderness between them. This wilderness is predictably dotted with countless abandoned ruins, temples, dungeons, castles, ziggurats and towers. Why are they abandoned? Beast men. In ages past, humans enjoyed an unchallenged dominance, but as more and more beast men evolved and crawled from the muck, this dominance started to slip. Physically, humans are weaker than almost any beast man, and the savage nature of beast men make them fearsome opponents, especially after they acquired human weaponry and learned how to use it. As such, humans were forced to congregate in large cities, and in doing so had to abandon many dungeons which housed cultural artifacts, powerful magic items, and more. Now human society is slowly decaying and more and more men and women are driven to head into the mysterious wilds and reclaim lost treasures (think a world of lost decadent sorcerous cultures like that of Jack Vance's Dying Earth, but with less science fantasy and more anthropomorphic fish). In my campaign, beast men are typically more beast than man. They use weapons, yes, but they are weapons stolen from men (and each type of beast man prefers different types of weapons). They also rarely build anything, preferring instead to inhabit pre-existing structures making minor modifications as needed. I'm very satisfied with this campaign idea, as I think it will provide endless opportunties for adventure hooks and dungeons. However, with beast men being such a primary focus, I knew I had to take care and diligence in designing them. A bunch of identical statblocks with superficially different appearances wasn't going to cut it; not by any means. As I set about creating these monsters, I arrived at certain key issues and points that I wanted to consider. I've unpacked them below. Granularity - This is a simple question, but an important one: how granular should the categories of beast men be? In my opinion, the more granular the better. Instead of lizard men we ought to have skink men, chameleon men, and iguana men (likely reading each name you got an idea of how one race would differ from the other). Instead of fish men we ought to have angler men, axolotl men and piranha men. Ibis men and bird of paradise men instead of bird men. And so on. I prefer this method because each animal has certain personality traits and symbolic resonances, and these can be used to generate ideas. Piranha men go into a frenzy when blood is spilled, ibis men have mystical abilities, chameleon men have wondrous powers of disguise, etc. This works in a game designer's favor as well because there are so many animals out there that haven't been statted up in this manner, and thus creativity isn't inhibited. Mechanical Differentiation - I began to veer into discussion of this in section 1, but it's really the crux of the issue. While beast men will obviously differ in tactics and personality, if they are similar mechanically this only accomplishes so much. As such, I like to make my beast men mechanically different whenever possible. In the Seven Rivers campaign, there are monstrous lobster men in one of the first ruins the players explore. If a lobster man rolls a high number on its damage die (a 7 or 8), it cripples one of its opponents limbs with the crushing force of its claw. Alternatively, it can use this claw to mangle its opponent's weapon (lobster men love to grab swords and bend them into unusable shapes). As you can see, this isn't anything revolutionary — it doesn't need to be. But it will provoke a tactical change in the players, as they'll know when exploring ruins inhabited by lobster men they better carry extra weapons, or find weapons too durable for lobster men to damage (a quest in of itself). Mechanical differentiation is easy enough to implement: for piranha men, perhaps once blood is spilled they go into a frenzy and are forced to focus all of their attacks on the wounded opponent. Maybe hawk men get to roll two initiative checks and take the better of the results because they are so fleet-footed. Frog men can have prehensile tongues which they use to deploy a small weapon such as a dagger. Certain types of insect men might spray their foes with pheromones, increasing wandering monster checks. By honing in on the defining characteristic of an animal and using it as the springboard, this process becomes dead simple. Studying nature reveals a whole host of unique defenses that can be mined for ideas. And this isn't even getting into magical abilities, which are likely appropriate for certain types of beast men which have pre-existing mythic connotations. Gender Dimorphism & Color - This is more a sidenote than a main consideration, but a great trick to pull on your players is making certain species of beast men gender dimorphic. Typically I deploy this by first exposing the players to the weaker gender, then having them encounter the stronger later on: oh, you thought male lobster men were bad? Just you wait (female lobster men in my campaign are bigger than males, and when they score a 7 or 8 on their damage die they sever a limb). An even more shocking trick to pull is to have one of the gender's able to cast spells, and the other not. Maybe male frog men aren't too challenging, but the females with the ability to cast basic shamanistic magic certainly are! In the same vein as gender dimorphism, it can be interesting to give different abilities to different colored beast men. In my campaign, white ibis men cast cleric spells, black ibis men cast magic-user spells, and the rare and near-mythical scarlet ibis men can cast both. Personality & Behavior - I expounded upon mechanical differentiation earlier, but defining each species' distinct personality and behavior is essential. As I like to be utilitarian when I design, I only concern myself with behavior that will have direct effects on the PCs. Here's an example: the ruin I mentioned earlier as being inhabited with lobster men contains many pools throughout. When the lobster men came to reside there, they made tunnels connecting certain pools together. This gives them (and the fish men who live alongside them) a distinct tactical advantage when navigating the ruin. Generally I like to consider how a beast man might treat its surroundings: some beast men will make modifications to existing structures, some will not. Some beast men collect treasure (crow men! ), some have no interest in it. Some are fascinated by human weaponry, some eschew it. Some are more intelligent than others, and some have even grown fond of human culture and attempt to emulate it. Bat men, for example, worship vampires, and are willing to provide their unwavering fealty to one (a vampire is essentially an angel to a bat man). Different varieties of beast men should employ different tactics. Some should capture their opponents live to devour them later. Some should perform hit-and-run maneuvers. Some should have pets they fight in concert with. The more you differentiate one species from another, the more tactically interesting each becomes. At their most ideal, once the players learn the tactics of, say, skink men, they should have a whole routine for dealing with a skink man lair. In time, players will also learn what type of treasure certain beast men like to gather, and can use this to tailor their decisions. Crow men obviously collect shiny objects, so they will hoard coins, but art and magic items mean nothing to them — whereas ibis men will clearly be in possession of magic items. Alligator men love collecting human weaponry and their lairs are richer than any armory. Treasure type is just a further method for establishing the distinct nature of each beast man. Some beast men, in mimicking humans, will have their own unseemly religions, complete with bizarre rituals. Deploying these can be a great way to unnerve players: after the bestial nature of iguana men are established, the players stumble upon an iguana man enclave. Therein the iguana men are conducting a clearly human holy ritual, complete with robes, candles and guttural chanting: a horrific scene, to be sure! How much of the significance of their actions do these iguana men understand? Though I stated earlier that beast men live in ruins, it may be interesting to allow certain beast men to build their own structures (see this post which may very well have inspired my love of beast men!). Insect men are certainly good candidates for this, and structures built by non-human intelligences always make for good adventure locales — doubly so locations that were once constructed by men and have now been altered by their new occupants. Here's where I'll divulge a little secret: the players don't know it, but there are actually many varieties of beast men that are equivalent in intelligence to humans (jaguar men are particularly cultured). But the PCs aren't aware of this at the start; it's a complicating factor to add a wrinkle to the campaign. Far outside of Ampyrsyvad certain colonies of beast men are beginning their own societies, using human society as a springboard but deviating in very odd ways. I won't discuss this too in depth because it's beyond the purview of this post, and if I started discussing beast man culture it would easily double in size. Tone - This is down to personal taste, but I find some beast men simply don't work for the tone of my campaign (typically beast men based off of "cute" animals such as mice and rabbits). Those, to me, evoke too much of a fairy tale nature. Generally, I find beast men work best when based off of animals humans tend to fear, or exotic animals we don't interact with often (a beast man based off an animal your players have never heard of would certainly catch them off guard — behold the binturong man!). Each DM will have to tailor the beast men he or she uses to his or her proclivities. This post grew longer than I expected. I didn't know I was so passionate about the topic until I sat down to write! I certainly hope some of these ideas are inspiring and will help others in designing monstrous humanoids. I may detail my campaign in greater depth in a later post if there's interest. The setup for this trap is simple: in the middle of an otherwise unadorned room stands a statue of a monstrous fish rising from a pool of water 10' in diameter and 6' deep. The water is unnaturally clear and pure. At the base of the statue rests a steel lockbox. The string is detectable if someone runs their hands beneath the lockbox (the string is located in the middle of the box's bottom and would likely not be felt by any standard method of gripping a large lockbox). The correct method of solving the trap is to bring the lockbox to the surface of the water, disable the catch/unhook the string, and open the lockbox without breaching the water's surface. Alternatively, if one were to tug the catch from a distance and keep it taut, the entire pool could be drained through the statue fairly quickly. Were this to happen, the charm making the box impossibly heavy would be negated and it could be opened normally. The players could also achieve this by scooping the water from the pool. 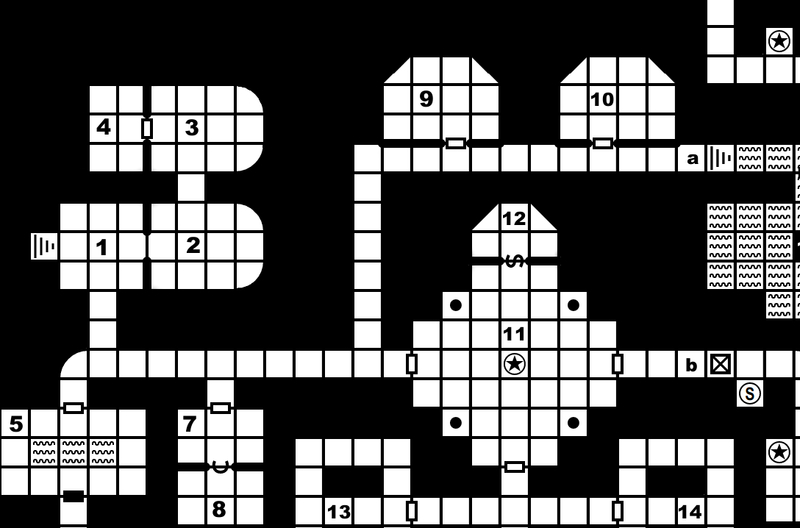 The room containing this trap should be accessed by a secret door that stays open for several turns so the players have to contend with wandering monsters while they protect their sleeping brethren/attempt to drain the pool. There are likely further methods to contend with this trap (as well as additional measures to complicate it) but I'll leave that it to individual DMs to embellish. 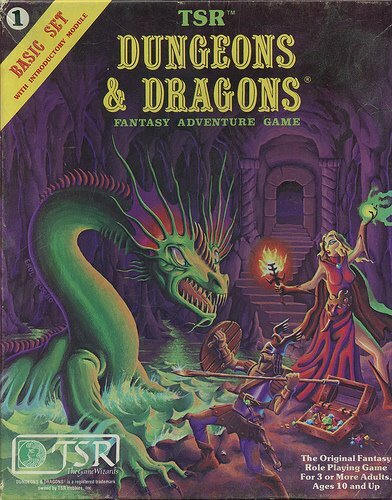 Originally I'd planned to open this blog with a series of essays exploring B/X D&D but writing them was getting tedious so I decided to shelve them. Besides, I imagine most people read these OSR blogs for elements they can directly import into their campaign, so I think I'll focus on monsters, magic items and traps for the time being. Over the next few days I'll be digging through my notes and finding some old monsters I created (I think I'll start with a series on oozes). Full disclaimer: I may have lifted the monster in this post from another OSR blog and embellished it a bit. If so, feel free to let me know and I'll give the proper accreditation. The existence of the golden jelly is simple: it lives to consume light. 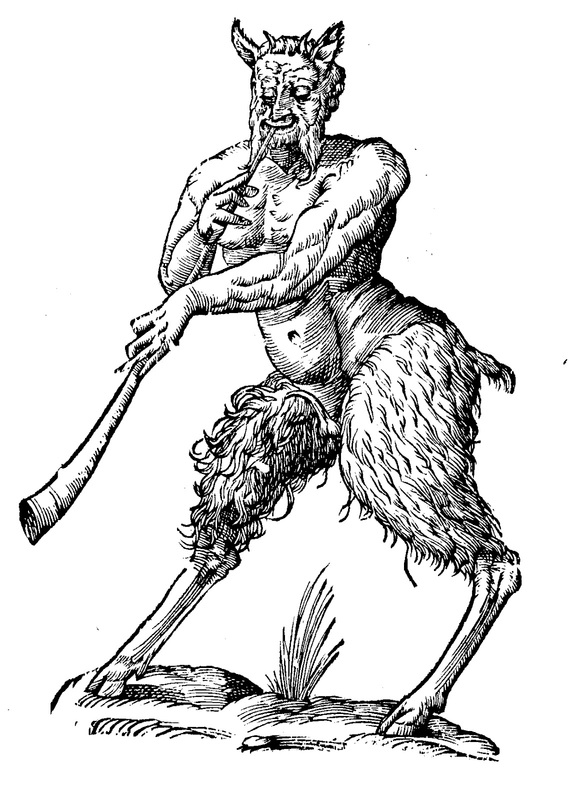 Torches, campfires, magical auras: this xanthous creature yearns after and swallows them all. Golden jellies form deep underground in dungeons and natural caverns. In their color and viscosity, they resemble honey. The genesis of a golden jelly is unclear; some philosophers propose that they are a physical manifestation of the dark's want for light. When any light (magical or mundane) is brought into a golden jelly's presence, the light will flicker or blink for a few moments before being extinguished. The jelly gains additional hit dice for each light extinguished thus, with the amount depending on the type of light: 1/2 for candles, 1 for lanterns or torches, 2 for campfires, and 3 for magical light. The jelly should probably be limited in the amount of HD it can gain in a specific time period -- say 5 in a ten minute turn. Note that if the jelly extinguishes a magical light (for example, that of an enchanted sword) it will never shine again. For every 2 HD the jelly possesses, it gains one pseudopod attack doing 1d6 damage. The jelly's pseudopods are faintly luminescent so it is possible to strike at them even in the dark. However, they are small and fast moving and as such should be treated as having AC 4. The jelly may also expend 1d8 hit points in order to release a burst of stored light (effectively blinding anyone in its presence if they fail a saving throw). When first encountered a jelly will have 2d3 HD. If the party encountering the jelly has multiple lights they should be extinguished in sequence so the party can watch the jelly grow more and more monstrous as their light dwindles. What should happen if a jelly is exposed to the sun is up to each DM to decide individually. Optionally, a golden jelly can gain different light-based spells as it grows larger. Using these should always require the jelly to expend xd8 hit points, with x being the level of the spell. Golden jellies are immune to damage from blunt weapons, but take full damage from bladed weapons. A darkness spell should destroy a golden jelly outright if it fails its saving throw. The effects of other spells should be decided on a case-by-case basis. Generally, golden jellies are susceptible to magic. Legends tell that if a golden jelly reaches full maturity (20 HD), it evolves into an utterly different being.